Chris Chelios would help lead the Blackhawks to the Stanley Cup Final in 1992, before being swept by the Pittsburgh Penguins. He was in top form for the 1992-1993 season, scoring 73 points and won another Norris Trophy. In 1995–96, Chelios would have another great season for the Blackhawks, scoring 73 points and winning his third Norris Trophy. Chelios was captain of the Blackhawks from 1995 to 1999. 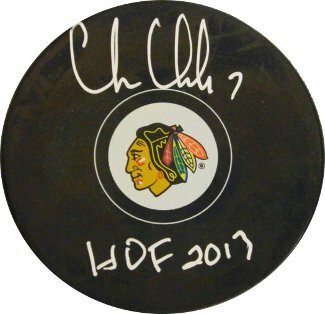 Chris Chelios has hand signed this Chicago Blackhawks Hockey Puck with HOF 2013 Inscription. Schwartz Sports Hologram and Certificate of Authenticity from Athlon Sports.